Also known as Kingsford-Smith Airport, Sydney Airport is the main airport serving the Australian metropolis of Sydney and is among the world's busiest. Our Sydney Airport guide includes contact information, as well as details on terminal facilities, transportation routes and nearby hotels. Sydney Airport's Master Plan 2033 was approved by the government in 2014. The plan revolves around long-term, large-scale expansion and modernisation of the three current terminals to cope with the predicted 74 million annual passenger flow in 2033. The Tourism NSW information desk is located on arrivals level 1 in Terminal 1. The desk is open from 0600 to 2300 and provides information and help with accommodation, tours and attractions in Sydney. Gold Ambassadors can provide airport information; these volunteers are stationed at help desks in the arrivals and departures areas of Terminal 1 and in the arrivals area of Terminal 2. Most routes to Sydney Airport are well signposted. From central Sydney, follow Elizabeth Street south and turn right onto Bourke Street. From here, take a slight left onto O'Riordan Street at the first set of traffic lights. This road leads directly to the terminal. The total drive time from central Sydney to the airport is approximately 25 minutes, depending on traffic. More detailed driving instructions are available on the airport's website. There are various options when travelling between Terminals 1 and 2. The 'T-Bus' shuttle service (tel: +61 2 9669 1899; www.carbridge.com.au) costs A$6; taxi transfers cost A$17-22; and the Airport Link train (www.airportlink.com.au) - which takes just two minutes - costs A$6. Qantas and Virgin Australia offer their own transfer options for certain passengers. Terminal 3 is adjacent to Terminal 2. Sydney Airport is located 9km (6 miles) south of central Sydney. Bus:Sydney Buses (tel: +61 131 500;www.sydneybuses.info) operates bus 400 from Burwood to Bondi Junction, calling at Terminals 1 and 3. The journey time to central Sydney is roughly 35 minutes and the fare is A$12.60. The bus stops are located on the arrivals levels of these terminals. Shuttle:Many shuttle bus companies provide a service between Sydney Airport and most city suburbs; these need to be booked in advance (see the airport website for full details). Many hotels can provide a transfer service for guests – most at an additional cost. Taxi:Each terminal has its own taxi rank. Companies serving the airport include: Taxis Combined Services (tel: +61 133 300; www.taxiscombined.com.au), Legion Cabs (tel: +61 131 271; www.legioncabs.com.au), Premier Cabs (tel: +61 131 017; www.premiercabs.com.au) and St George Cabs (tel: +61 132 166; www.stgeorgecabs.com.au). The journey time to the city centre is around 30 minutes, and the single fare starts at around A$45. Rail:The Airport Link (tel: +61 2 8337 8417; www.airportlink.com.au) rail service connects both the domestic (fare: A$17.40) and international (A$18.20) terminals to Sydney Central Station (journey time: 29 minutes) and city suburbs. Terminal 1 has its own railway station, while Terminals 2 and 3 share a station; both stations are accessible from the Arrivals level of their respective terminals. Full banking services are available from ANZ Bank in Terminal 1. Currency exchange facilities are located in Terminals 1 and 2. ATMs are located in all terminals. There are many restaurants, cafés and bars at Sydney Airport offering a wide variety of international and Australian cuisine. Places to eat and drink include sushi specialists, Chinese eateries, Italian restaurants and licensed bars. There are more than 150 shops at Sydney Airport, ranging from souvenir retailers and designer outlets to wine merchants and speciality stores. Duty-free shopping is available in Terminal 1. Smarte Carte operates luggage storage services in Terminals 1 and 2. Lost property offices (tel: +61 133 793) are located in Terminals 1 and 2 to assist with queries regarding luggage misplaced at the airport. Baggage trolleys are available throughout the airport. Other facilities available at Sydney Airport include: a medical centre, located on the third floor of Terminal 1, pharmacies, in the public and departure areas of the same terminal along with an additional pharmacy in Terminal 2, showers, a prayer room and a child activity centre, all of which are located in Terminal 1. Children's toilets are installed in all female toilets and baby-changing rooms are conveniently located throughout the terminals. Qantas (www.qantas.com.au) hires out a number of meeting rooms in Terminal 3, while Virgin (www.virginaustralia.com) offers similar services in its lounge in Terminal 2. The Kingsford Smith Suite in Terminal 1 (tel: +61 2 9667 9111) has space for up to 200 delegates, with overhead projectors, screens, flipcharts and whiteboards, while AV equipment and sound systems are available on request. Several nearby hotels also offer extensive conference and meeting facilities. There are seven airline lounges in Terminal 1 and one in Terminal 2. There are also two VIP lounges in Terminal 1. Free Wi-Fi internet access is available throughout Sydney Airport's Terminals 1 and 2 – internet kiosks are also located both pre- and post-security at these terminals. Postal and photocopying facilities can be found at Australia Post Office, located in the pre-security departures area of Terminal 1. Mobile telephone hire is available from Optus and Vodafone in the arrivals area of Terminal 1; an additional Vodafone outlet is located in Terminal 2. Facilities for disabled passengers include ramps, adapted drinking fountains, showers and dedicated toilets. Lowered telephones, text telephones and telephones fitted with induction loops are also available. Wheelchairs are available from the Tourism NSW desk. Disabled parking spaces are located at the front of Terminal 1 for valid badge holders. Any passengers who may require additional assistance are advised to contact their airline before travelling. 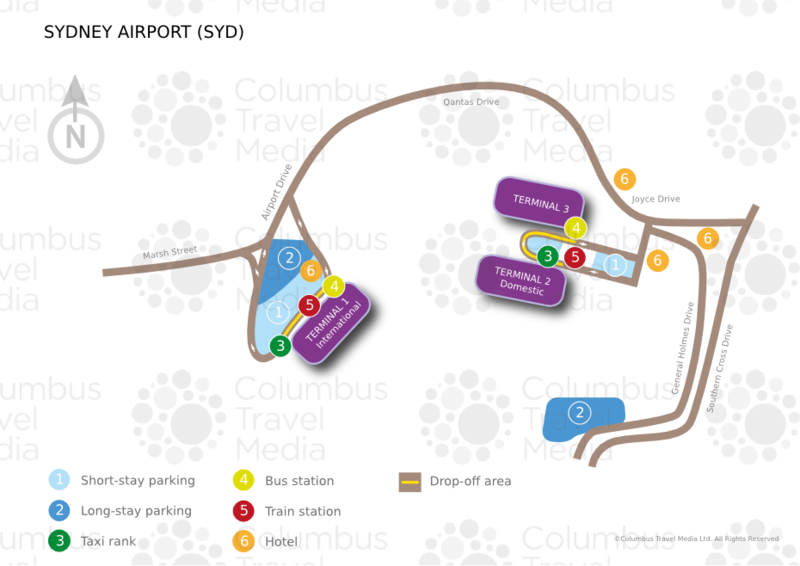 Sydney Airport has three car parks. The International Car Park is located opposite Terminal 1 and offers short- and long-term rates. The multistorey Domestic Terminal Car Park, which is directly linked to Terminals 2 and 3, provides short-stay options. The domestic long-term Blu Emu car park can be accessed via Ross Smith Avenue from General Holmes Drive or Sir Reginald Ansett Drive; regular courtesy shuttles connect this car park to the terminals. There is a designated pick-up area offering 10 minutes free parking at Terminal 2, while pre-bookable bays are available for those seeking to leave their vehicle temporarily to pick up or drop off passengers. Car hire companies represented at Sydney Airport include: Avis, Budget, Europcar, Hertz, Redspot and Thrifty. Desks for these operators are located on the arrivals levels of Terminals 1 and 2.